The pangasius meat is very tasty, juicy, with a delicate flavor. 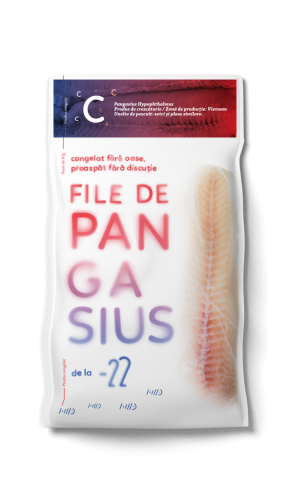 Skinless and boneless, pangasius fillets prefer being sliced immediately after being captured and suddently cooled to -40 degrees, thus retaining all of its nutrients, taste and own texture, for extra freshness. Frozen individually, the pangasius fillets are transported in controlled cold conditions, with special trucks and boats until the final destination, when reaching its favorite temperature, -22 degrees. Pangasius meat can be cooked in the oven or pan.